Some of the best dining in Panama City Beach is just steps from your door. From classic dishes to seafood feasts, you can experience the best dining around. I can personally recommend these restaurants! Check it out! Welcome to Liza`s Kitchen. We are a tiny little gourmet sandwich spot located across from the beach in Panama City Beach, Florida. Our food philosophy is using the freshest ingredients and not cutting any corners. We make everything from scratch, including Focaccia bread, soups and salad dressings. Even the mayonnaise is homemade! The combinations are limitless because of our wide variety of fresh and unique ingredients. Open for lunch Monday through Friday and Brunch Saturday and Sunday. This is definitely where the Foodies Eat! Try the Hippie Chick sandwich - my favorite! Location: 7328 Thomas Drive - 1 mile from your condo! Schooners, the Last Local Beach Club, is open 7 days a week from 11 in the morning till the wee, wee hours of the night. Lunch is awesome. Dinner is awesome. The bands are awesome. The beach is awesome. The sunsets are awesome. As a matter of fact, this just might be the best place on Earth. This is the best place on this end of the beach to relax, have a drink and watch the sunset! Directly on the beach and only one mile from the Princess and Nautical Watch. Location: 5121 Gulf Drive - 1 mile away! The Wicked Wheel is a "custom concept" theme Bar and Restaurant that was created for all ages to enjoy with one thing in mind: to share our love for classic cars, custom bikes, and all things cool. Along with the unique decor and classic southern comfort menu, which includes their perfectly seasoned secret recipe fried chicken, this one of a kind location is sure to become a favorite Panama City Beach landmark. My favorite family restaurant! Voted the best fried chicken in Panama City and Panama City Beach three years in a row! This restaurant specializes in chicken, shrimp, hot dogs and burgers. Reasonable prices. Location: 10025 Hutchison Blvd. - 4 miles from your condo! Cozy, bare-bones strip-mall space featuring Cajun & Creole dishes from po` boys to jalape�o oysters. Some of the best food around! My favorite PCB dive! This restaurant has the best fried catfish and shrimp on the beach! Fried cheese grits and homemade tuna dip! Everything fried is the best! Yum! Open for lunch and dinner year round. 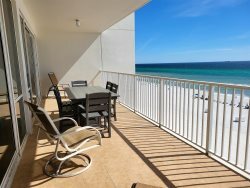 Location: 10440 Front Beach Road - 3.5 miles from your condo! Firefly is a unique casual fine dining experience located in Panama City Beach, Florida. When you walk through the beautiful wooden doors you soon realize it`s not a typical beach restaurant. The warmth of the Firefly Bar and the Library Lounge leaves you feeling like you are at home with friends. Dining under the grand old oak tree will take your senses away to a dinner outdoors at a Mediterranean bistro. This is the perfect restaurant for that "special" night. Dine under the "fireflies" at Firefly! Dat Cajun Place is owned and operated by Trudy White. Trudy is from Houma, Louisiana and she really knows what she is doing when it comes to cookin� truly authentic cajun foods! Dat Cajun Place is the place you want to go for Poboy Sandwiches, Gumbo, Daily Specials including Red Beans, Jambalaya and Etouffee. On Fridays starting at 6 p.m. we have the best Boiled Seafood on the beach! Look no further for real Cajun food, stop by today! This is a restaurant you DON�T want to miss! Location: 8501 Thomas Drive - 2.5 miles from your condo! There are still quite a few of you out there that think that Triple J is just a steakhouse. As the area`s premier steakhouse, we think we make the best steak in Panama City Beach. That said, we do a whole lot more than just great grilled beef! For over ten years we have been providing families and diners from around the country with a full array of delicious selections ranging from fresh Florida seafood, to grilled pork and chicken, and the ever popular mile high burgers & sandwiches. In addition to the expansive Dinner Menu, the home-style Lunch Menu at Triple J is extremely popular and has been a favorite with the local business community for years. And you thought we only did steaks.... We believe that our restaurant is a unique and relaxing place to visit. It is primary our goal to uphold this standard of uniqueness while offering the finest, freshest food and paired with the attentive service that you deserve. So please� be comfortable, enjoy yourself and indulge in great food� the way it was meant to be. Location: 2218 Thomas Drive - 3 miles away! Sisters of the Sea & The Dive Bar is making a splash on Panama City Beach with a menu of award-winning dishes in Seafood and New American cuisine. Located in the Pirates Cove Marina, Sisters of the Sea�s is best known for it`s award-winning dishes including the Sirens� Song, a rich broth with steamed mussels, shrimp and scallops. It took the Best of Show at the Mississippi Gulf Coast-based Chefs of the Coast. The Fried Strawberries won a media people�s choice award in Biloxi, Mississippi, and last but not least, Sisters� Gumbo Gris Gris (with its dark roux, chicken, Conecuh sausage and fried shrimp) even beat out casino chefs to take home a Best Gumbo award. ?Not only do we have amazing award winning dishes, but we are also home to live mermaids and pirates who love to melee and swim with guests of all ages! ? Swim with mermaids and play with pirates, come for the food and stay for the fun! Location: 3901 Thomas Drive - Only 2 miles from your condo! We have fun here! Panama Pizzeria welcomes you to it`s family of fun! We are a locally owned family run business that takes pride in all we do for our customers. We are always trying to bring smiles to everyone who walks in the door. From the fun, laid back atmosphere to our friendly staff that always try to go the extra mile to making sure your visit is always nothing short of excellent. We want Panama Pizzeria to be a place that you frequent often, whether you live here locally with us or are one of our guests in town. We welcome you to come hang with us for years to come! Location: 3123 Thomas Dr - 2.5 miles from your condo! Owner, John Certo, is a third generation chef from New York City. He started cooking at nine years old, and has always had a passion for cooking up delicious food that people enjoy. �We don�t do fancy. We do fresh, and you can�t fake fresh!� Fresh breads, cookies, muffins and danish daily. The homemade French toast with fresh strawberries is everyone`s favorite! Capt. Anderson`s restaurant is one of those rare "family" restaurants that not only survives, but strengthens and improves through the years. The landmark waterfront restaurant is celebrating its 47th anniversary in 2014, and every year has witnessed remarkable growth without loss of quality. The restaurant has grown to 725 seats and, six nights a week, serves over 250,000 guests during its 8 month season. Founders, Jimmy and Johnny Patronis set high standards of hard work and consistency for the younger Patronis generations, and they still pull their shifts at the busy restaurant, stopping by to welcome old friends and loyal customers... occasionally bussing a table or taking a special order. Their passion for the business is undoubtedly the root of Capt. Anderson`s success. Location: 5551 N Lagoon Dr - 2.5 miles from your condo! Welcome to Panama City, home to Domino`s and the best pizza delivery in FL! We`re the restaurant to beat, giving you tons of delicious options and delivering them right to your door! Meat-lovers and vegetarians alike can find something delicious on the Domino`s menu. Plus we do more than just pizza. We`re proud to offer entr�es like chicken wings and oven-baked sandwiches, as well as sides like salads, chips, drinks, and our stuffed cheesy breads. And don`t forget about dessert! Why the wide selection? It`s simple: we aim to bring you the best. To many restaurants maty claim to be famous overnight - They also tell you that they have the best of everything to be found - J. Michael`s has been here a long time - Same owners and management since 1976 - and the only claims made about this place will be done by you the customer, and especially the food is up to par. If not, be sure to let us know - Thank you come back, and tell a friend about us. Location: 3210 Thomas Drive - 2.5 miles from your condo! Your Panama City Beach Destination for Seafood, Music & Fun - World Famous Pineapple Willy�s is the Panama City Beach Seafood restaurant where it all began! Since 1984, William Buskell, (aka Pineapple Willy) has remained true to his mission of great food, great cocktails and great staff. Today, we still serve the best ribs on the beach, the staff is as friendly as ever, and the music & drinks at Willy�s Live just get better every year! Location: 9875 S Thomas Drive - 3 miles from your condo! Shane`s Rib Shack in Panama City Beach, FL is a family restaurant with the best slow-smoked BBQ in town including hand-chopped BBQ Pork & Baby Back Ribs! Dusty`s Oyster Bar is a true locals` favorite. They are Obviously known for having the best oysters at Panama City Beach, but as a bonus they also have the best buffalo wings as well. Belly up to the oyster bar and you can hear casual talk of local fishing stories, beach conditions, weather, and a variety of other local topics. While you are there, get to know the owners, Cally and Pappa John, there are just great down-to-earth locals. Hershey�s Beach Ice Cream Shop offers 40 Flavors of creamy, smooth hand dipped ice cream�Scooped into crisp homemade waffle cones or piled high into sundaes loaded with fudge, caramel and toppings. For the true ice cream lover�we recommend you �create your own� Shake or try our famous BIG Banana Split! Hershey�s location at 8815 Thomas Drive is a gathering place for every generation, from tiny tots to senior citizens, with indoor and outdoor garden seating to accommodate our customers and their families. At Hershey�s Beach Ice Cream Shop you�ll find people laughing, joking, talking and savoring Hershey�s REAL ice cream! HERSHEY�S Ice Cream�Real Ingredients. Real Ice Cream. Real smiles.